Can Fish Drown In Water? You may be wondering can fish drown and the answer is yes, fish need oxygen to survive just like humans. If the water a fish is swimming in becomes devoid of oxygen a fish can drown in water, this can frequently occur if you leave a goldfish in a small bowl without a running filter. Fish need oxygen to survive, much as land animals do. This raises a question: Can fish actually drown in water? As it turns out, fish can drown in water. “Suffocate” may actually be a better term for what happens to fish, as it isn’t technically drowning. Drowning is when the lungs fill with water and are unable to get the oxygen they need. Fish can die from lack of oxygen, but this would more adequately be termed suffocating or asphyxiating. In order to answer the question of how a fish can suffocate underwater, it would be helpful to know a little about the biology and anatomy of a fish. Fish have organs that require oxygen, much like humans and other mammals. Fish have hearts and brains, the cells of which need oxygen to function. The heart pumps oxygenated blood throughout the body of the fish, bringing oxygen to the brain. Fish also have kidneys and livers like humans do, which help break down waste materials and fats. The liver maintains an important role in the destruction of old blood cells, enabling new blood cells to be created so that the body of the fish can keep getting oxygen. 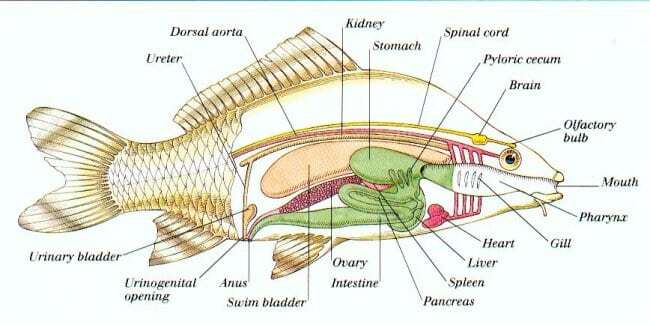 The spinal cord of the fish provides structure to the whole body, as it does with any vertebrate. The fish’s spinal column also serves to relay information about the body to the brain and carry signals from the brain to the rest of the body, via a network of nerves and nerve roots which run the length of the spinal column. One of the organs of a fish is called a swim bladder, which helps them control their position in the water. The swim bladder fills with gas to help the fish maintain neutral buoyancy and keep their position in the water. Not all fish have swim bladders though. Fish that don’t have swim bladders may need to keep swimming to maintain their position in the water, or else they will sink to the bottom. How Do The Gills Of A Fish Work? As you’ve read, the bodies of fish maintain several organs in common with humans, all of which require oxygen. Yet unlike humans, fish don’t have lungs. So if the bodies of fish need oxygen, yet don’t have lungs, how do they get their oxygen? The oxygen of a fish comes in through the gills of the fish. Gills are composed of groups of cells known as epithelium. The epithelium is delivered deoxygenated blood by arteries, and as water moves across the membrane of the epithelium, the oxygen dissolved in the water is absorbed by the veins and blood vessels. The carbon dioxide that is produced by cell respiration is released during this time. Many fishes have four gills on each side of their body, consisting of interlinked columns of cells. Different fish push water over their gills in different ways. Frequently fish push water over their gills by widening the skin flaps which sit over the gills. Fish open and close their mouth to do this. Lowering the bottom of the mouth causes the skin flaps to widen, allowing water in. When they close their mouths, the water is trapped within the gills and the oxygen is pulled out of it. The water is then expelled through an opening known as the operculum. The level of oxygen dissolved in water is much lower than the number of oxygen particles in the air. Air is about 210,000 parts per million of oxygen, or about 21% oxygen in general. In contrast, water has around 4-8 parts per million of oxygen. Because the oxygen content is so much lower in water than in air, the surface area of a fish’s gills needs to be rather large to provide it with an adequate supply of oxygen. The fact that fish are cold-blooded, rather than warm-blooded, means they need less oxygen, which helps compensate for the large surface area needed by the gills. Cold-blooded animals have a slower metabolism than warm-blooded animals and therefore need less oxygen. 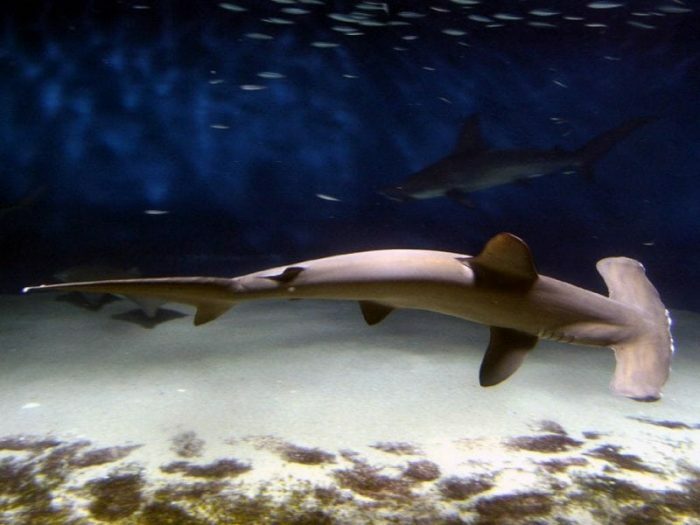 Some fish, the cartilaginous fish like rays and sharks, usually have five-gill slits on each side of their body. These gill slits are supported by a cartilaginous gill arch, which helps it maintain its structure. Most species of sharks need to breathe by forcing water over their gills, which they do by continuously swimming forward. Saltwater fish also have to have a mechanism that can expel excess sodium from their bodies. This is because the large amount of blood that is needed to exchange oxygen and carbon dioxide is exposed to hypertonic, salty water. Freshwater fish need to do the opposite, they must keep their body’s level of sodium appropriately high by excreting extra water. Fish have chloride cells to help regulate the salt balance in their bodies and maintain homeostasis. How Do Fish Suffocate Underwater? The fact that fish need to oxygen to live means they can suffocate in a few different ways. 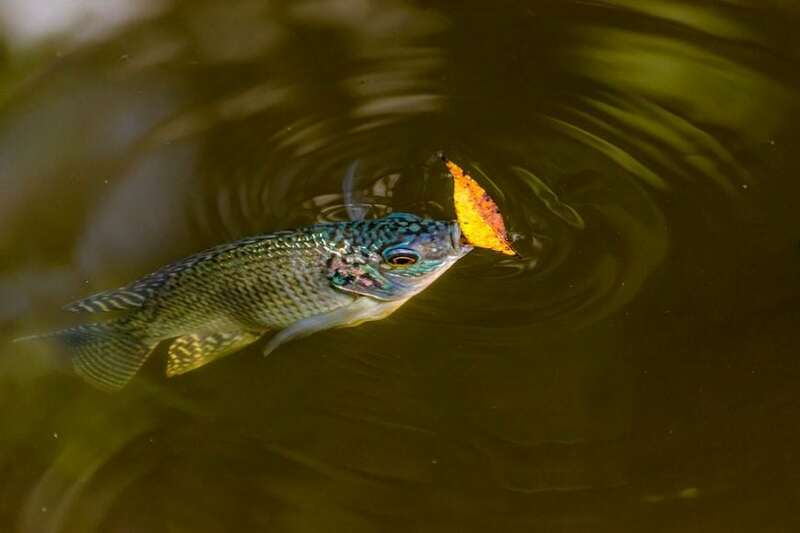 Taking a fish out of water will naturally cause it to suffocate, as it isn’t able to pull oxygen from the air with its gills. As for how a fish could suffocate underwater, this can happen in a couple ways. Much like us, fish expel carbon dioxide when they breathe. If they are in an area where carbon dioxide builds up and not enough fresh oxygen is dissolved in the water, they can die. This isn’t likely to occur frequently in nature (though too many plants in a pond can destabilize oxygen levels and kill fish), but fish in aquariums or tanks that don’t cycle the water often enough can easily die. The oxygen is dissolved into the water from the surface, but the surface area of a tank is limited in size. For this reason, air pumps are employed in tanks to bring deoxygenated water to the surface where it can be refilled with oxygen. If the gills of a fish are damaged, they won’t be able to breathe as well, increasing the likelihood they will suffocate. Gill damage can happen due to attacks from other predatory marine creatures or due to chemical damage from compounds like nitrates or ammonia. There’s one other way a fish could suffocate underwater. Species of fish which rely on ram ventilation, swimming forward to push water through their gills, can die if they can’t swim forward in the water anymore. If the fish becomes trapped or is dragged back through water, it will suffocate. Those who hunt sharks sometimes kill them by dragging them backwards towards shore, suffocating them. So while fish aren’t really capable of drowning, they can die from lack of oxygen. Remember that if you have any fish at home or are planning on getting any fish.